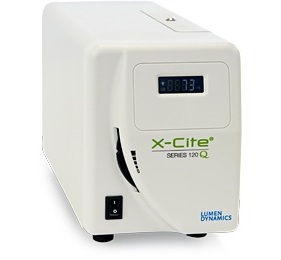 The X-Cite® 120Q excitation light source uses a 120-watt lamp to deliver rich spectral excitation energy and uniform wide-field fluorescence microscope illumination to the sample plane. The proprietary Intelli-Lamp® provides more than 2000 hours of life. The lamp is pre-aligned so changing it is a simple, one-step process. The optional adjustable iris allows the user to set the level of illumination. The X-Cite® 120Q is ideally suited for fluorescence microscopes being used in routine assays and as an excitation light source for use in multi-user facilities.